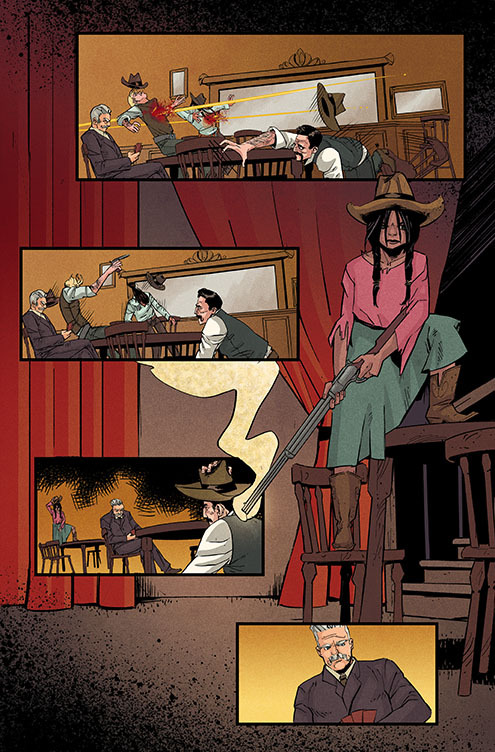 A fantasy western adventure, Black Jack Ketchum is an upcoming Image Comics publication. 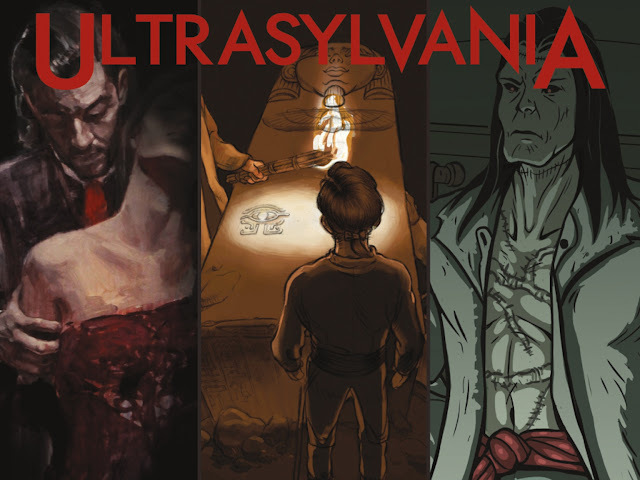 I interviewed writer Brian Schirmer (Ultrasylvania) about the four issue mini-series including his real relationship to the historical figure Black Jack Ketchum. Me: You mentioned that you had familial ties to Tom Ketchum. Can you talk about your connection to him and what he was supposedly like in real-life and in the comic? Brian Schirmer: Black Jack Ketchum is a distant relative. Great-grandmother on my mother's side was a cousin. As such, I'd heard his name and stories all my life. The real-life Tom Ketchum robbed trains, killed people, and was ultimately hung for both. The end. Except, when you read more of the story - and from differing sources - you not only learn the horror that befell him when he was executed, but also realize that this guy was quite possibly suffering from some form of mental illness. Whether hearing voices and conversing with them or beating himself repeatedly for saying something "stupid", he tended to make more than a few people uncomfortable. Our Tom Ketchum, the one in the book, he's generally not doing those things. He's more of an everyman. I mean, he's done some questionable things, but he's adamant that he hasn't done a fraction of the things this "Black Jack" has done. He asserts that this is all a case of mistaken identity. Pity for him that no one is willing to take the time to hear him out. 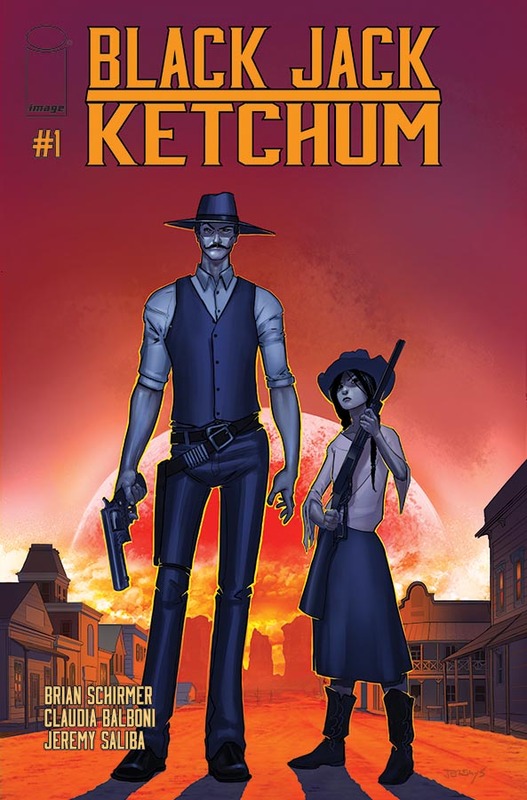 Me: If you could spend the day with Tom Ketchum, what would you two do? Schirmer: If we're talking the historical Tom Ketchum, then I suppose I'd try to keep him calm, buy him a drink at the local watering hole. There's much in the historical record to suggest that he was - at best - a squirrely fella, equally as likely to smack himself upside the head as draw on you in a panic. 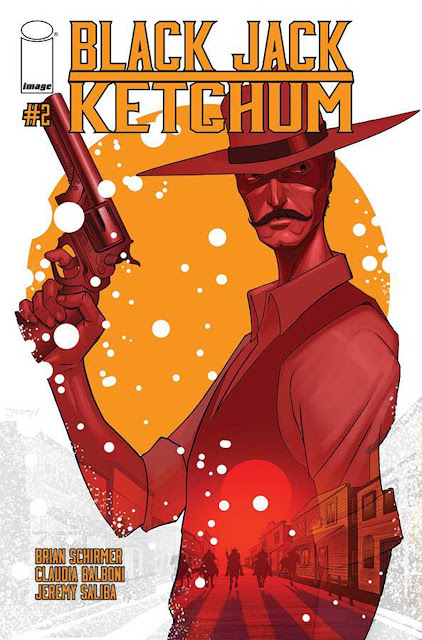 If we're talking our Tom Ketchum... I suspect I'd be running just alongside of him as faceless, unstoppable Terminators-of-the-Old-West chased him down without a concern for collateral damage. That is... I wouldn't want to be the collateral damage. Me: Will we be seeing any other historical figures? Can you tell us who they are or give us a hint? Schirmer: Yes. There's definitely one person who shows up. I don't want to give it away because it's a rather fun addition to the story. At least to me. There are other characters who are allusions to or amalgams of historical figures, a little something that plays into the conceit of this being a dreamlike universe. I will say with regard to the one person that it won't be a subtle reveal. It will be made very clear to the reader. Me: How would you describe some of the other characters, such as Ketchum’s talking sidearm, the gambler and the mute girl with the Winchester? Schirmer: They're absolutely meant to be taken with the utmost sincerity. It's a little known fact that everyone - everyone - in the Wild West had a talking gun. It's just been glossed over in the history books. Me: Why did you decide to blend the western and fantasy genres together in this story? Schirmer: Honestly, that aspect came to me in a dream. As I say, I'd known about Black Jack my whole life, but it was just a couple years ago when I had a random dream that featured things like the Dusters - our faceless gunmen - and saloons that basically function like transporters in Star Trek. When I woke up, I wrote as much of it down as I could and just put it away. Sometime later, when it became clear I'd be developing a Western, I dug out that notebook and felt it might be interesting to have Black Jack Ketchum as our guide through such a messed up universe. 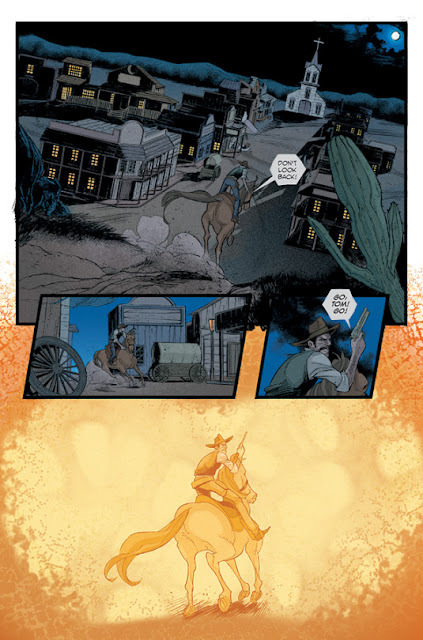 Me: What are some of your favorite western and fantasy comics? Schirmer: The couple issues of Jonah Hex that are written by Jimmy Palmiotti and Justin Gray and illustrated by Darwyn Cooke. I'd turn to those quite a bit. Especially issue #50. The storytelling is so crisp. It's actually one of a few dozen single issues that I go back to again and again for reference and inspiration no matter what I'm working on. Blueberry, of course. Desperadoes. "Fantasy" comics is an incredibly broad category. I mean, if we're talking swords and magic and that kinda stuff, then I'd have to mention Rat Queens, Conan - especially the team of Kurt Busiek and Cary Nord - and Bone. If you want to talk fantasy comics that take those basic tropes and mix them in with other goodies, then the list is insanely long. I'll mention Saga, Promethea, The Invisibles, Hellboy, and Casanova... and I've barely scratched the surface. Me: What is the tone of Black Jack Ketchum? It sounds like it could be dark, but at the same time has elements such as a talking sidearm. Is it more comedic or gritty? Schirmer: More than anything I'd call it surreal. What we'd call "weird things" are happening on almost every page, but to these characters they're normal. Tom's freaked out because people are convinced he's someone else and they're trying to kill him. He's not freaked out by the fact that some of these "people" have no face. The fact that his gun talks is pretty much the same thing. Though, yeah, you can make the argument that his sidearm is a bit of the comic relief. He/It operates as Tom's conscience a lot of the time. Sort of like Jiminy Cricket. Sort of. Me: How did you come to work with your cover artist Jeremy Saliba and artist Claudia Balboni? Schirmer: Jeremy and I have known each other for many years. We worked together on the very first anthology that I produced out-of-pocket back in... 2009 I think it was. We've worked together in one capacity or another ever since. 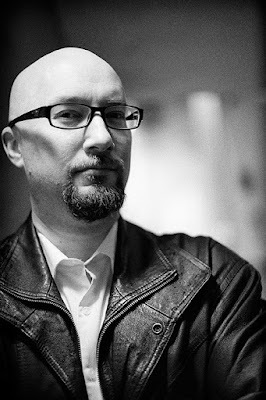 He was the editor and co-creator on Ultrasylvania, a self-published project that allowed us to get our names out there. It's safe to say that book led to us getting the gig at Image. As for Claudia, the project had received the green light from Image Central late last year, and then within a matter of weeks our artist had to pull out. I had a couple hours of panic before I saw this as an opportunity wherein I could potentially meet some other truly accomplished illustrators while looking for the person who would truly bring this story to life. Various friends and acquaintances introduced me to some amazing artists, but ultimately Larry Watts (Dynamite’s Army of Darkness) showed me Claudia’s work and I was hooked. After she and I traded emails, she sent me her renditions of a few pages of Black Jack Ketchum. We showed those pages to Eric Stephenson and we all agreed that she knocked it out of the park. Me: How would you describe their art styles in Black Jack Ketchum? Schirmer: Better than anything I could have dreamed. Or, in this case, better than anything I did dream. Me: I know your first published work, Ultrasylvania, is an alternate history taking place in 19th century Europe with Dracula and Frankenstein’s monster serving as world leaders. How did you come up with such a unique concept? Schirmer: I was traveling Europe in the summer of 2011. Like any good writer, I had my trusty notebook with me at all times and I was jotting down little bits of dialogue here, half-baked notions there. One of the latter was something along the lines of: "What if Dracula hadn't remained shut up in his castle for centuries and instead decided to become a leader on the world stage?" I couldn't tell you for certain where I was when I wrote that down - I think I was in Paris - but it stayed with me. I also couldn't tell you a single other thing that made it into that notebook. I suppose sometimes all it takes is having the one good idea spill out of you. Schirmer: Persistence. 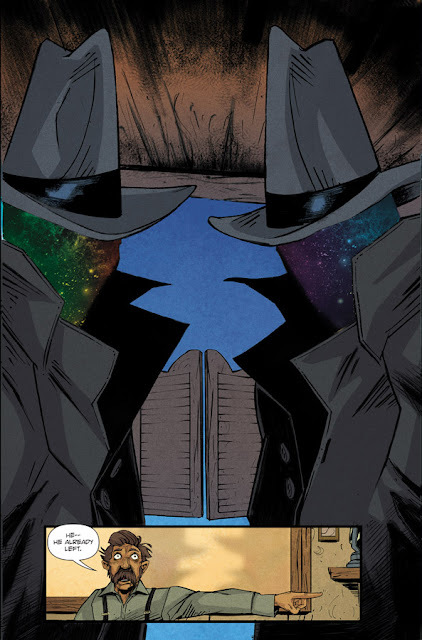 I teach writing for comics at an art university and after five years of doing so I realized I could boil the whole class down to that one word. You keep doing it and doing it and doing it. And you keep going back to people in the industry, showing them that you've done something more, showing them that you're not going away, and - ideally - showing them that you're improving with every step. Put in the time. Do the work. Show the right people. Repeat. Persistence. Me: Thank you for your time Brian. Look for the first issue of Black Jack Ketchum on December 2nd, 2015.